Vortex’s new top of the line spotting scope is powerful, vivid, and easy to use, and it edges out similarly priced competitors spotting scopes in its class. In late 2016, Vortex Optics unveiled their redesign of the popular Vortex Razor HD model. The name is the same, but this new model looks and functions better than ever. The most obvious upgrade is a larger objective lens in the higher magnification models, up to 85mm from the previous model’s 65mm lens. The Razor HD now sports a wide angle lens, offering a greater field of view versus the previous design. The focus ring has been moved to the middle of the scope body, and this offers easier adjustment and an overall sleeker design. In short, there’s a lot to like about the new Vortex Razor HD. Let’s take a closer look at all it offers and how it performs in the field. 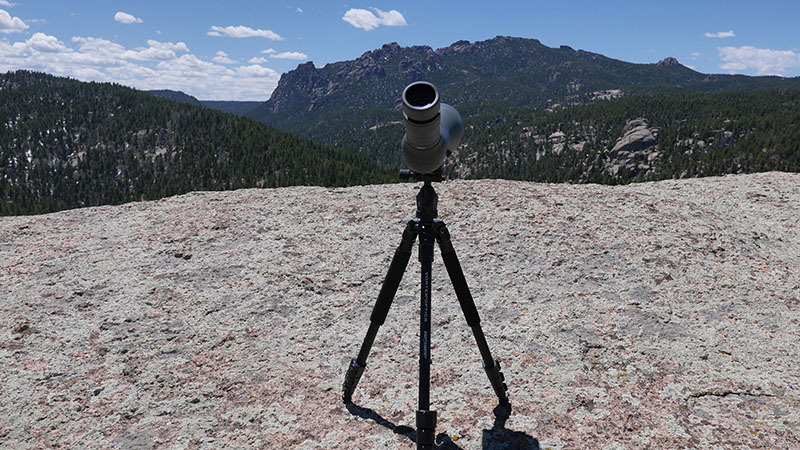 I’ve tested the Vortex Razor HD 27-60x85mm Angled Eyepiece for my uses and this review. It offers the widest range of magnification at 27-60x, and it has the larger objective lens of 85mm. Yes this larger objective lens means a little more weight, but it also translates to greater image quality and a larger field of view. The Razor HD 27-60×85 has a removable wide angle zoom eyepiece that can be left on the optic while on the field or stored separately to save space when needed. The eyepiece features a twist-up eyecup standard in most optics today, and it has three preset positions to choose from. Most of the time I found the best viewing position was to have the twist-ups open all the way. This optic is powerful and easy to use, and I’ll explore below. But first, a look at all the specs in the Vortex Razor HD. Lenses: APO System with Triplet Apochromatic lens provides premium color sharpness. Lens Coatings: Fully Multi-Coated (every lens surface treated) with XR Plus coatings to maximize light transmission and fight glare with anti-reflective treatments. Plasma Tech coating processes ensure the lens coatings will last. ArmorTek scratch-resistant coatings protect the lens faces from damage and smudges. Glass: Premium HD (high-density) extra-low dispersion glass brings whatever you’re watching to life with exceptional resolution and color fidelity. Prism Coatings: Dielectric Prism Coatings are applied to prisms to create bright images with true to life color. Waterproof / Fogproof: Sealed O-rings keep undesirable moisture and dust out, and an Argon treatment keeps the scope clear at any altitude or humidity level. 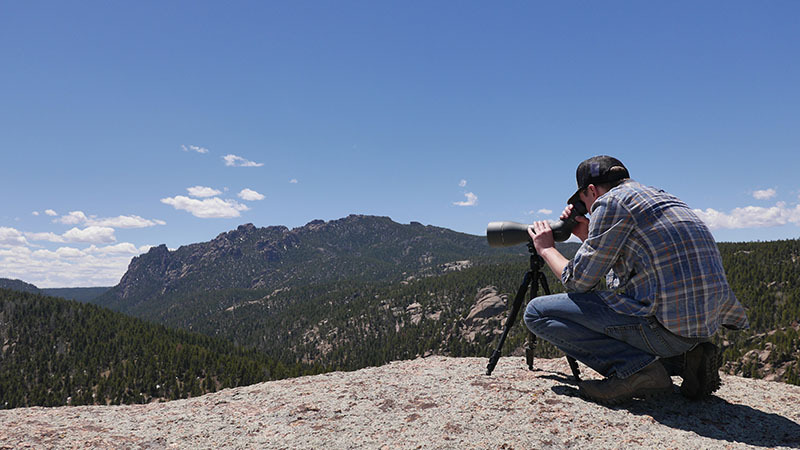 I’ve setup and tested the Vortex Razor HD in numerous places, from my back yard bird watching to the hills and ridges of the Rocky Mountains. I’ve even applied it to a little amateur star gazing. In all these circumstances, the Razor HD has performed like a dream. It’s powerful and easy to use, and from the moment you take it out of the box, you’ll be exploring the world around you in stunning detail. Let’s start with it’s simple, sleek design. Less is more in the Vortex Razor HD, and there are two primary points of adjustment. In the middle of the body is the focus ring. It is large, easy to grip and provides a wide range of adjustment. 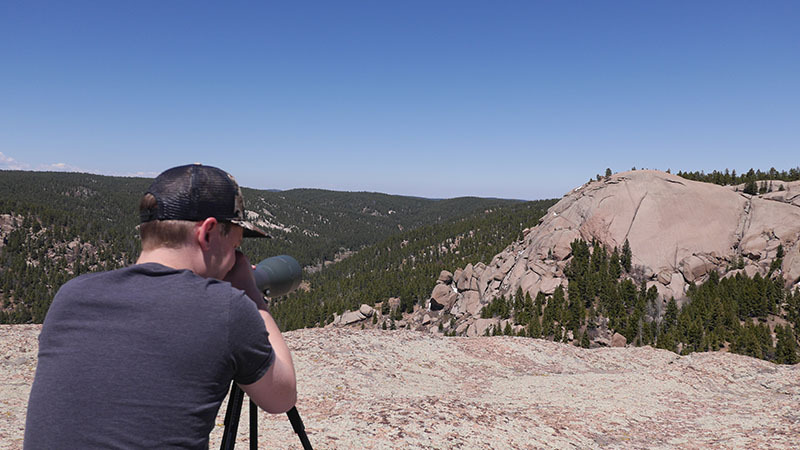 The focus ring can be easily used while wearing gloves, and if the scope is used in a pinch handheld instead of tripod mounted, you can steady the scope and adjust the focus all at the same time. At this section of the scope, the body is roughly 3 inches across. Moving up to the wide angle eyepiece, it locks in securely to the body and allows precision focus from 27x to 60x. Both adjustment points require the right amount of force to operate – not too much and they’re not too loose either. Without a doubt, the best asset in the Vortex Razor HD is its high definition image capability. This is the most advanced spotting scope that Vortex has produced, and it doesn’t disappoint. Colors are true to life through the scope, and everything is sharp and distortion-free from edge to edge. Often where lower end scopes lack is in this edge to edge sharpness. The image can blur at the edges, effectively reducing your overall field of vision. Another area that lower end scopes lack in is preserving image quality when you dial them up to the maximum magnification. I’m pleased to report the Razor HD preserves image quality all the way up to 60x. One other item to note is how this scope performs in low light conditions. A scope doesn’t do you much good on a hunt if you can’t use it during dawn or dusk when game is moving. Well there’s no concern of missing game in low light with this spotter, the lens coatings are great at encouraging light transmission. At a certain point I feel like it’s better than the naked eye in low light. I also used this scope in stargazing, and it picks up the light from stars and the moon gracefully. In short, there’s no concern about low light use with the Razor HD. The scope is a little heavy as I’ve mentioned before. I’m not exactly thrilled to pack it and the Vortex High Country Tripod into a backpack that contains my camera gear as well as other essentials, and then scramble up steep inclines common in the Rockies. However, the high magnification ability is a must for me in this terrain, and I wouldn’t go down to the 48x just because of the weight. It’s really only a 20 oz. difference or so anyway. All in all I’ve managed to get along hauling it just fine in the field, so don’t let this fear stop you from upgrading to an awesome scope. Once you get it set up in the field, you’ll feel like me – it’s totally worth it. A big reason to add a spotting scope to your gear arsenal comes in the added advantage of digiscoping. For those not familiar, this is the practice of taking photography or video through the spotting scope. I’ve had a chance to test this purpose with the Razor HD, and the photos came out surprisingly great right off the bat. I don’t have an official digiscoping rig for Razor HD, but I was able to snap good photos through it with my Panasonic GH-3 equipped with a pancake lens. The camera matches up surprisingly well with the wide angle lens on the Razor HD, and I imagine other cameras would do the same. You do have to take several photos to ensure you capture a quality shot as vignetting can occur. However I was able to capture good photos completely absent of a vignette in the Razor HD. 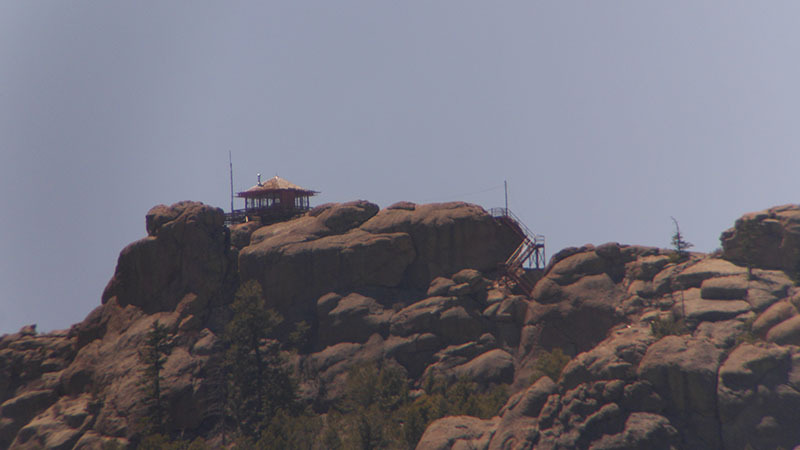 This photo of a local fire watch tower in the Rockies was captured midday at max magnification (60x). This is the unedited photo with no cropping of a vignette. There is a little discoloration from the distance and the sun, but all in all its an interesting photo and it shows just what possibilities are available with a spotting scope in your arsenal. I did not take any video through the Razor HD for lack of a mount, but there are a wealth of universal smartphone digiscoping adapters that would be great for this purpose. Balance can be a tricky thing when you mount a digital camera to a spotting scope, and I wonder if this is why Vortex has not released an official adapter for the Razor HD update yet. Another great feature in the Vortex Razor HD is the nylon carrying case. This case is extremely well designed and built for use in the field. When used for storage and carry, the case features both carrying handles and a strap to put it around your shoulder. You are able to deploy the scope in the field without taking the case off. A round zip-off front opens the objective lens for viewing, and Velcro secure points allow you to fold up the back of the case to use the eyepiece. There is even a zipper that allows you to mount the scope to a tripod while keeping it in the case. All in all, it’s an excellent design that will make a big difference if you carry the scope in the field often, and it’s included in the box. I was able to test the Vortex Razor HD with the new Vortex High Country Tripod. This solid yet portable tripod is designed for those who take their optics deep into the wilderness like me, and it’s a great asset to your pack. It only weighs about 2 lbs., and it packs down small with an included nylon carrying case. The anodized aluminum tripod legs are sturdy and extend out easily. It’s a simplified design and there are no supporting bars that fold out, just one solid attachment near the ball head. An exchangeable optics attachment plate is used for mounting the spotting scope, and you lock the attachment plate to the spotting scope. When you’re ready to mount the scope to the tripod, you simply slide the attachment plate into the tripod, lock it in place, and you’re good to go. The tripod legs are telescoping and you get a wide range of adjustment possibilities. 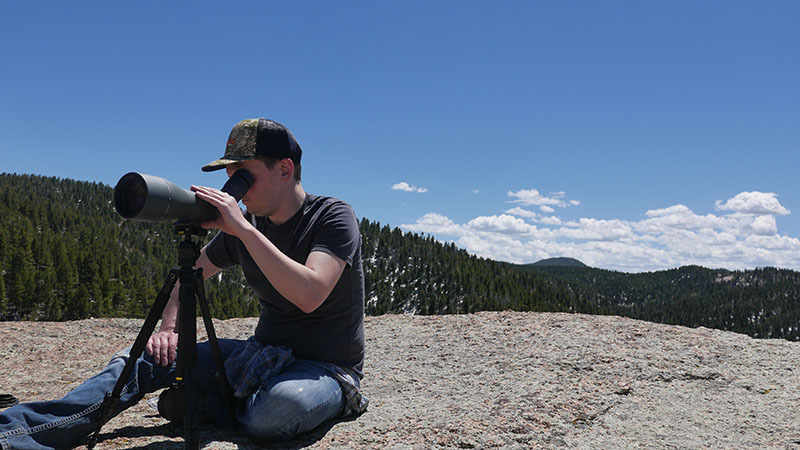 I’ll admit, mounting the spotting scope to the tripod in rocky, uncertain terrain made me a little nervous. To add to my trepidation, it was pretty windy in some areas I tested the tripod. The image of the scope falling flat on its objective lens did haunt me (although, see VIP Warranty Below), but the tripod held the scope in balance and kept things secure. If you raised the scope up and extended all the telescoping legs, you’d certainly want to keep a firm grip on it just in case. It never hurts to talk about Vortex’s incredible VIP Warranty, and this can certainly make a difference when you’re shopping for spotting scopes. 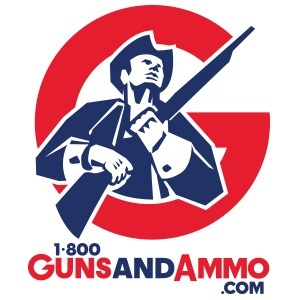 The VIP, or Very Important Promise, is a stellar warranty plan, and they will repair or replace your scope should it become damaged or defective. What about the fine print? Vortex won’t ask you how it happened or who’s fault it is, they just want to bring your product back up to equal working order. What if you’re bad at record keeping (like I sometimes am)? You don’t need a receipt or a warranty card to be eligible for the VIP Warranty. Vortex has you covered, and this plan really makes a difference when you go trekking out into wild places with big, sharp rocks like I do. Of course there are a couple restrictions. The policy does not cover deliberate damage or cosmetic damage, but honestly who would want to smash one of these beauties on purpose? Plus a little cosmetic scratches give the scope character – although I must say I treat mine like precious cargo everywhere I go, so I’m not looking to scratch it up anytime soon. Finally theft of the scope is not covered under the warranty, but your homeowners or renters insurance policy should cover it if it is stolen. In this case, make sure you keep the receipt and a photo stored in a safe place should the need to file a claim arise. Overall, I’m really impressed with the Vortex Razor HD Spotting Scope. For my money it beats similarly priced competitor models. 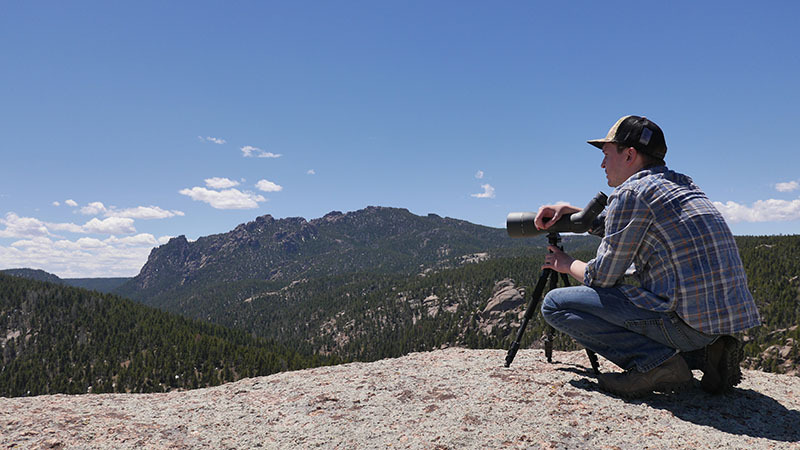 The ways in which this scope can enrich your outdoor activities are nearly endless. 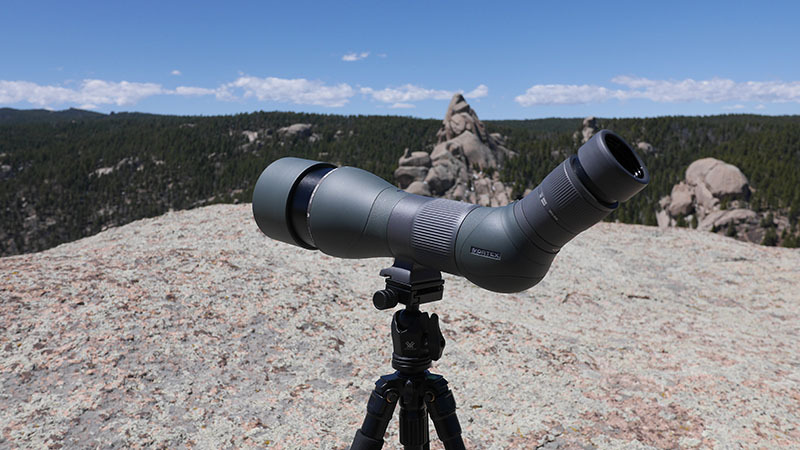 From hunting and scouting for game in the high country, to wildlife watching in the field or on your deck, the Vortex Razor HD is the perfect optic for the job. It’s powerful and produces vivid high definition images, and it’s rugged and easy to use. There’s really not more you could want out of a spotting scope at this price point. 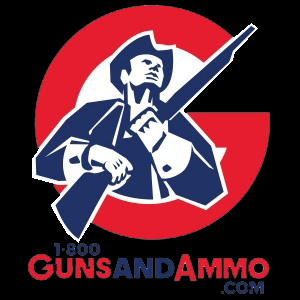 Sure it’s not up there with some of the $3000 plus spotters, but at it’s MSRP price point of $1999 ($1599 at the 1800GunsAndAmmo.com), it really does rub shoulders with the top tier of spotting scopes. I would like to see more digiscoping accessories for the Razor HD. I don’t believe the old Razor HD Digiscoping kit works with the new model, and an updated model has yet to be released by Vortex. This is really my only knock on the Razor HD, and it’s a pretty slight one at that. Vortex has done excellent work with this optic, and it’s without a doubt worth the purchase price. Hunters should definitely check this scope out, and the matte green coloring is a real benefit versus some shiny black scopes on the market. Birders and wildlife watchers will be pleased as well. 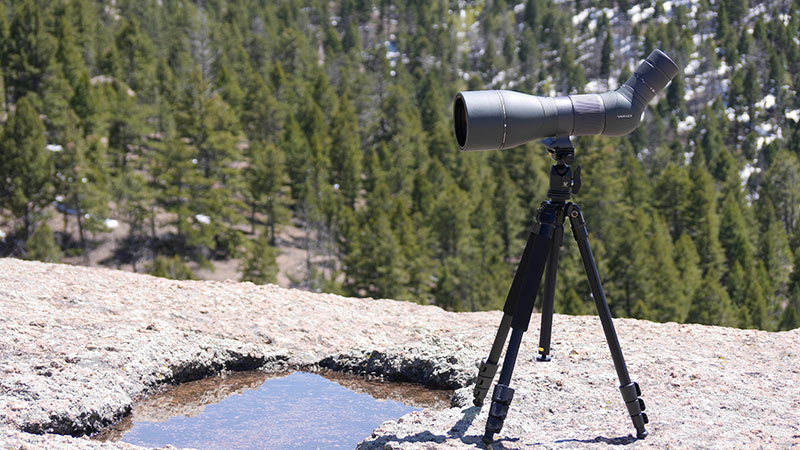 This spotter is the real deal, and it should be at the forefront of your list if you’re in the market for a new spotting scope.